A team of 10 people from 1st Donegore Presbyterian are travelling to Tanzania with local charity, kids4school, to take part in a work and witness programme at the end of June. 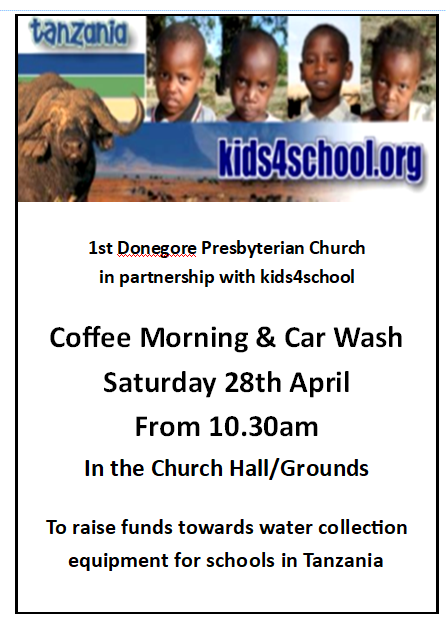 In partnership with our Boys Brigade we are holding a Coffee Morning and Car Wash. All funds raised will go towards much needed refurbishment of water collection equipment to enable children in Tanzania to have access to clean drinking water. Also, we are asking for donations of new, or good quality second-hand children’s clothing to take to families in Tanzania. Items required: football shirts, t-shirts, boys shorts, summer skirts and dresses, flip-flops and light plimsolls (gutties!). Clothes donations may be brought to the Church Halls on the day of the coffee morning, or at other times dropped into boxes in the Choir Room in the Church or upstairs in the Youth Room in the Church Halls.